Every Wednesday night my husband and I (along with two other couples) help out at our church’s Youth Group. It is such a blessing to get to know some of the 6th-12th graders in our community. The Youth Pastor at our church does an amazing job with all the kids and we are just excited to be along for the ride and help out with trips, conferences and leading small group discussions each week. So Wednesday nights are a bit crazy around here. Mike and Rachel (one of the other couples) have three kids. Their three along with our daughter, Kenley, head to AWANAS at a different church. My mom and sister babysit all the kids and run them to and from AWANAS. So my job on Wednesday nights is to provide a meal for anywhere from 12 to 15 people!! Usually we just do a quick, easy crock pot meal. But last week I wanted to test out a new recipe. 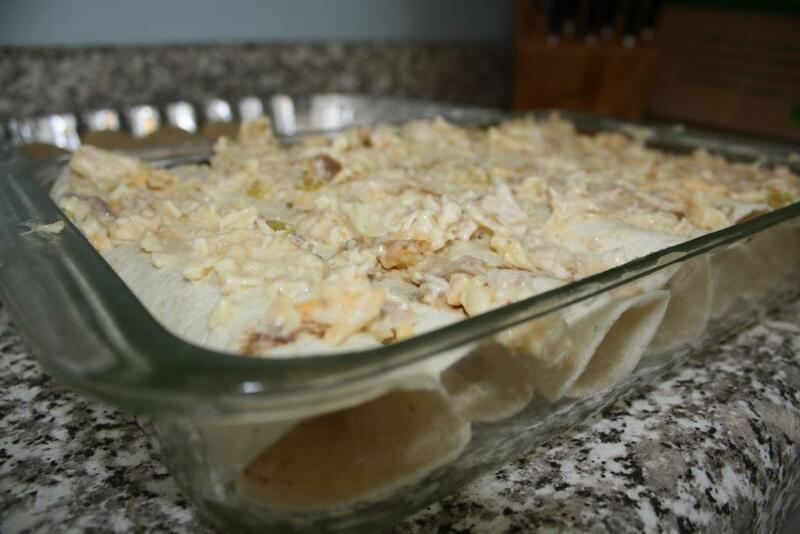 I was a bit nervous because Wednesday nights need to be kid-friendly meals (since there are 7 kids), but I hoped they would enjoy my new, healthy version of Cheesy Chicken Enchiladas. So my inspiration was a skinny enchilada recipe I saw on (what else?) Pinterest. 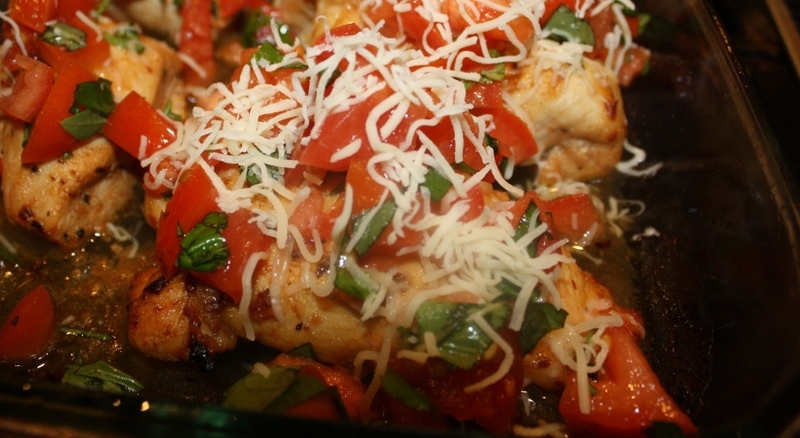 They looked super yummy, but one major flaw: Cheese was missing! I *need* cheese with my Mexican food. How about you? 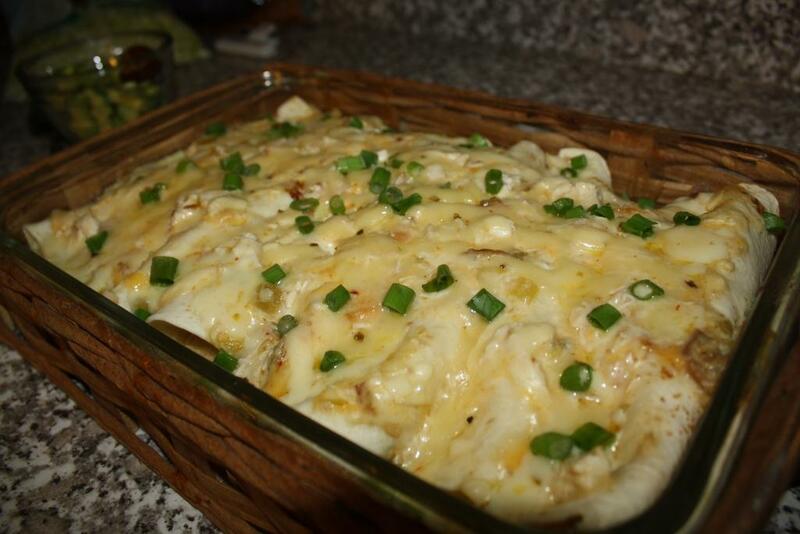 I also like my cheesey chicken enchiladas to be super creamy. So how could I avoid all that sour cream? I used low-fat plain yogurt and some melted butter instead. This way we weren’t sacrificing on taste, but we were getting 30% less fat! 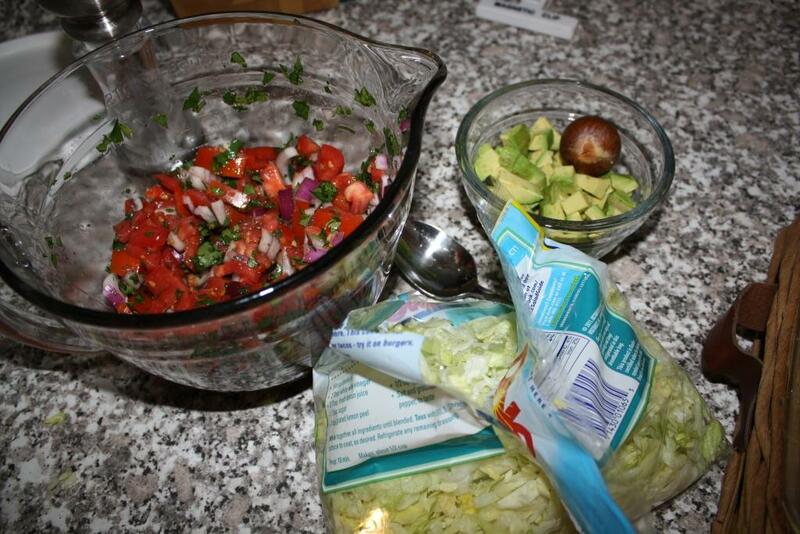 I also made my homemade chunky salsa and then added some fresh, diced avocado for the topping. 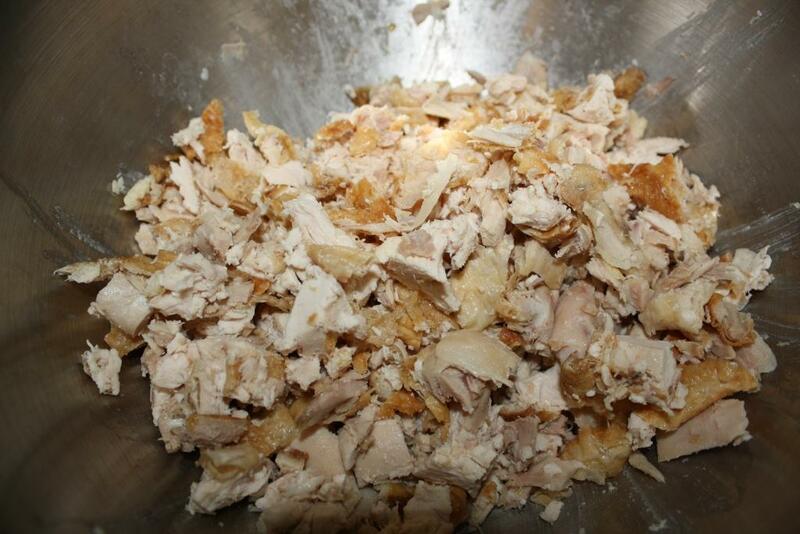 I purchased a whole rotisserie chicken from the grocery store and chopped the meat in a large bowl. 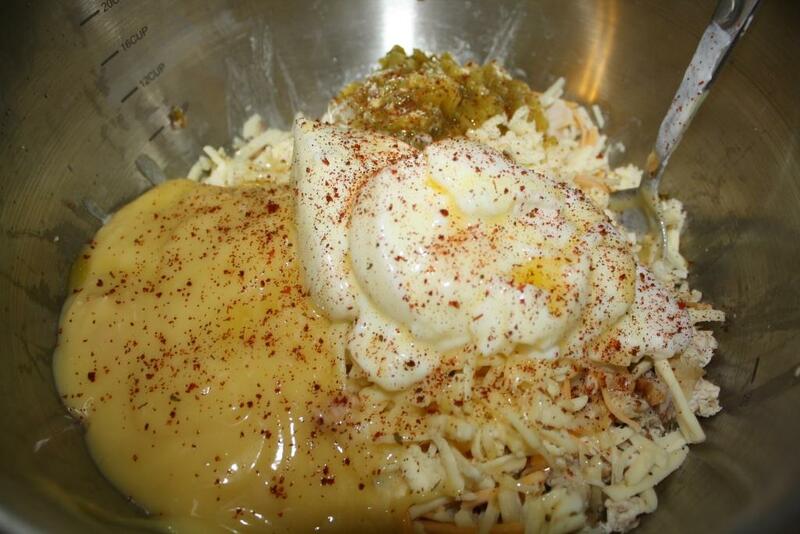 Shred the cheese over top of chicken. Then pour in yogurt, butter and soup. Add onion, garlic and green chilies. Season with black pepper (I added some Pampered Chef Chili Lime Rub to the enchiladas and to my homemade salsa, you could just add some Mexican seasoning). Stir till well combined. If it seems too dry add a bit of milk to the mixture. Reserve 1 cup of the chicken mixture and set aside. 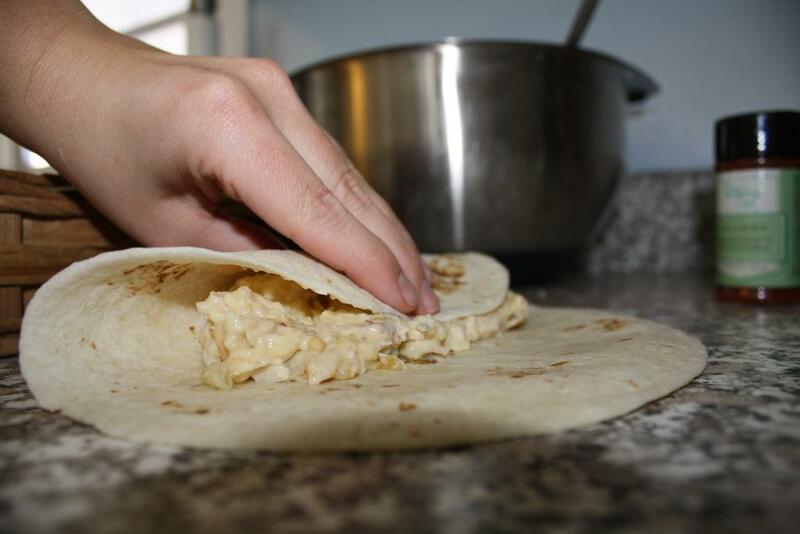 Spoon 1/2 cup of chicken mixture onto each tortilla and roll. 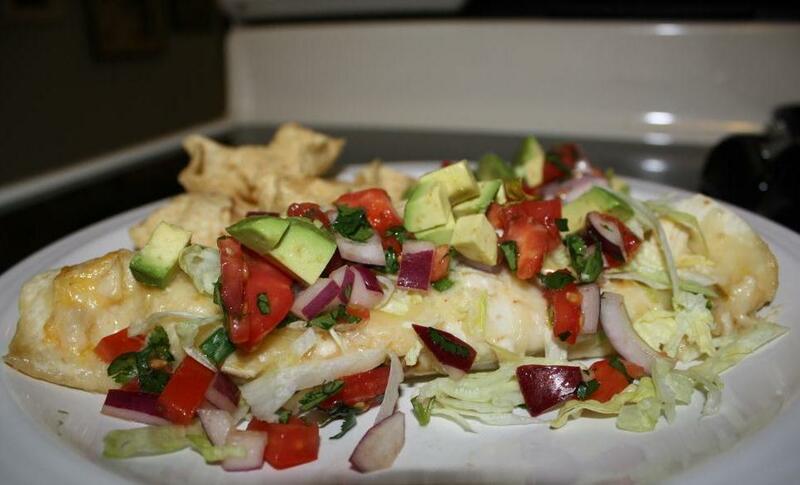 Lay tortillas seam side down in a greased casserole dish. 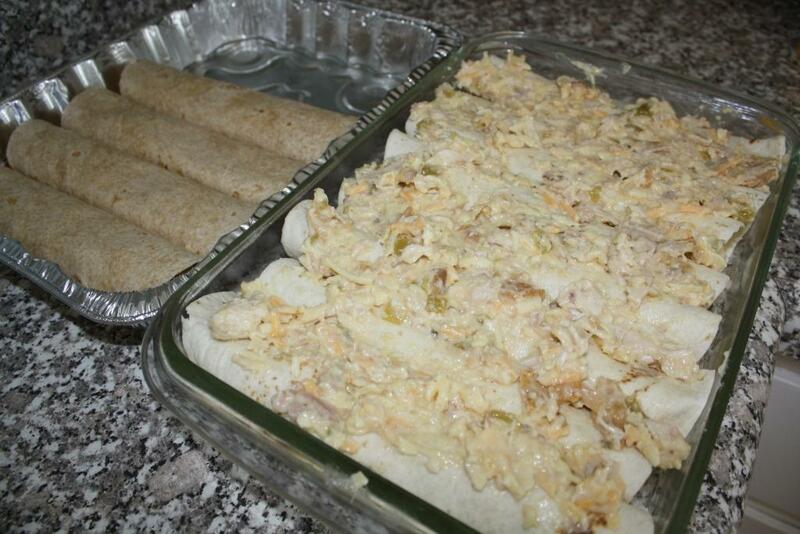 Spread the reserved cup of chicken mixture evenly over the enchiladas. Cover with foil and bake at for 25 minutes. Uncover; sprinkle evenly with remaining 1/2 cup cheese and 1/4 cup green onions; bake an additional 5 minutes or until cheese melts. 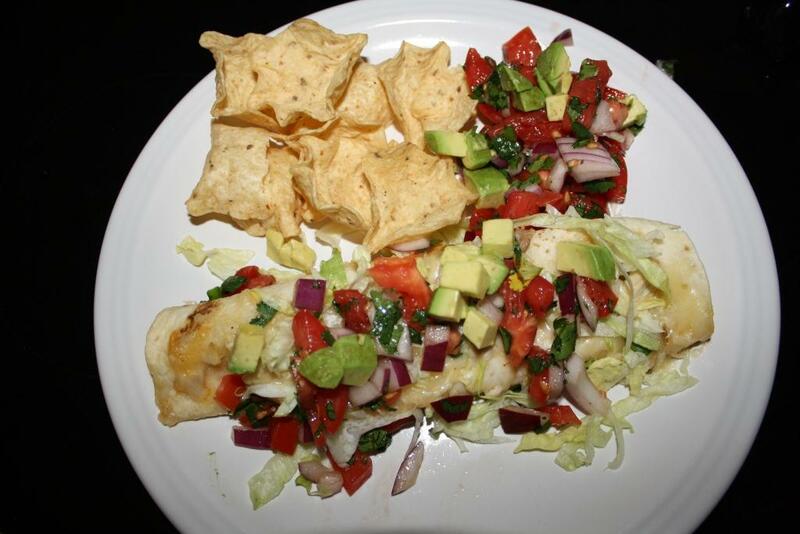 Serve with tortilla chips, homemade chunky salsa and diced avocado on top. You may remember me talking about my detox/diet. I am now finished with it. I lost 20 lbs! I feel so much better, more energy, and most importantly I am not craving carbs and sugar anymore (which was my main goal). 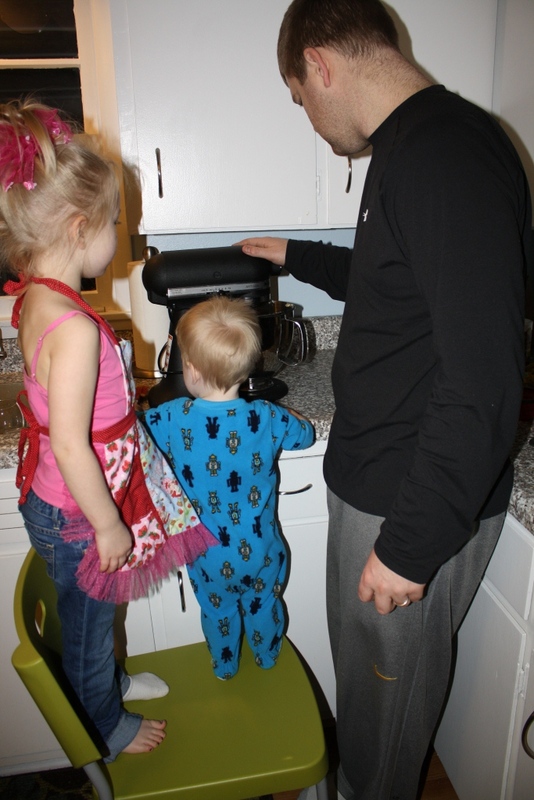 So now instead of eating something sugary,sweet every day, we are having a special Family Baking Day on weekends when we are home! We make a delicious dessert, we each have one and then bring all those leftovers to church on Sunday or to our Youth Group. Here is the recipe. 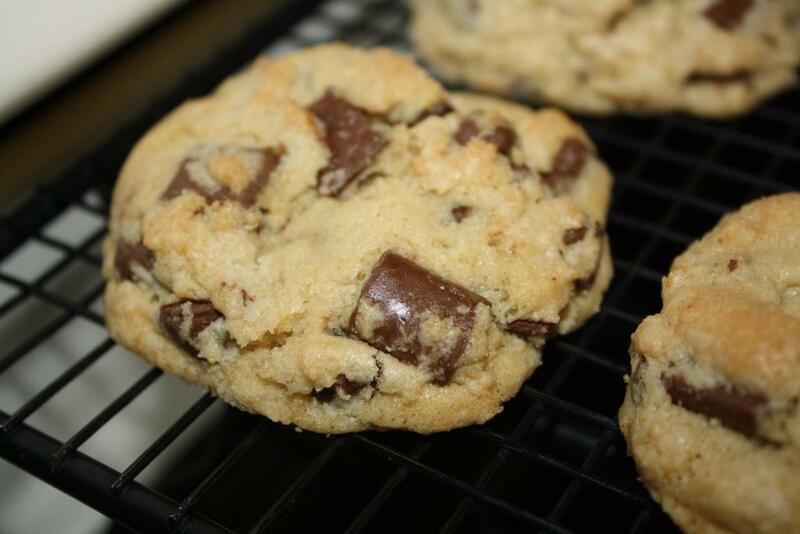 The only thing I changed was I used semi sweet chocolate chips AND milk chocolate chunks. 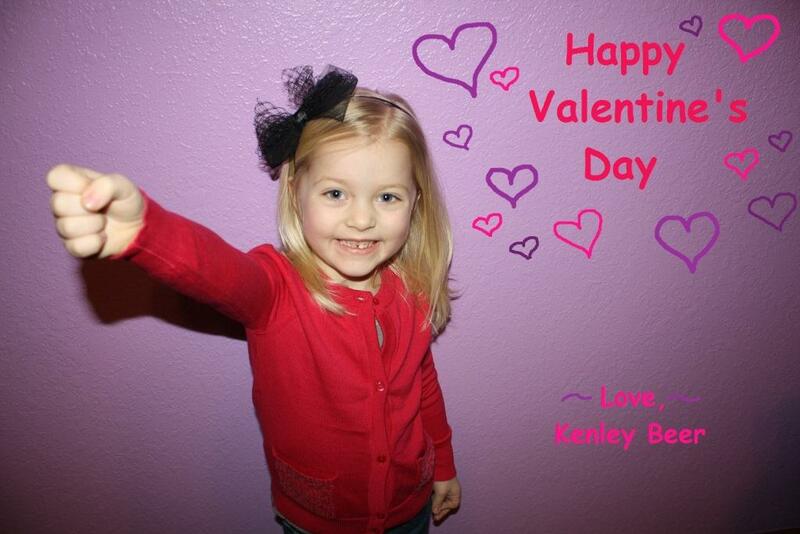 Little side note: I can’t wait till Kenley is old enough to make her own Valentines. Until then, it’s a mommy job. I took a picture of Kenley holding out her fist (in front of my sister’s purple wall). 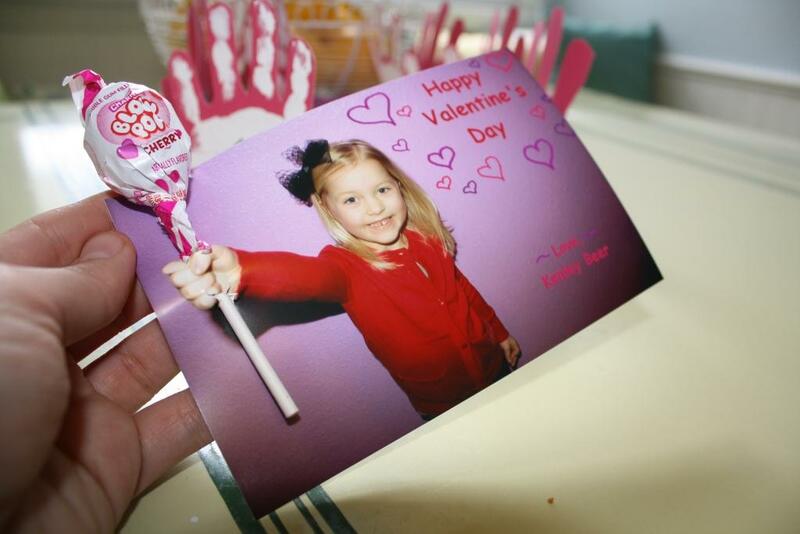 Then I used Microsoft Paint to type the Valentine’s message and draw hearts on the JPEG file. 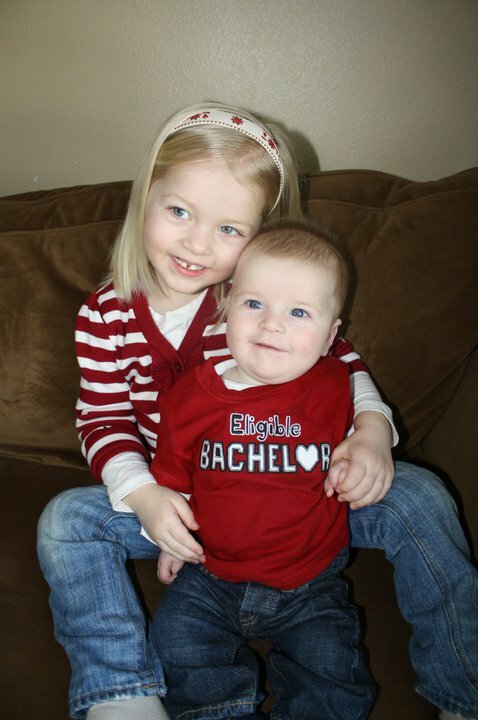 I uploaded the picture to Shutterfly.com. 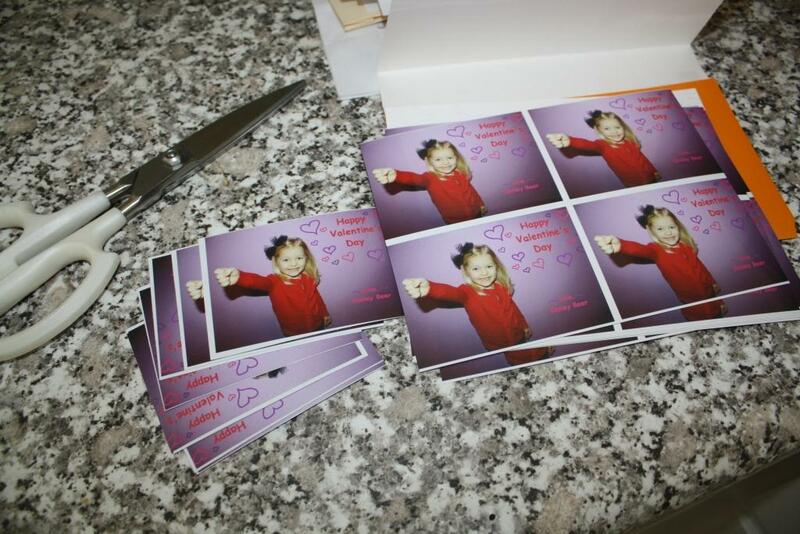 I ordered 12 sheets of wallet sized prints. 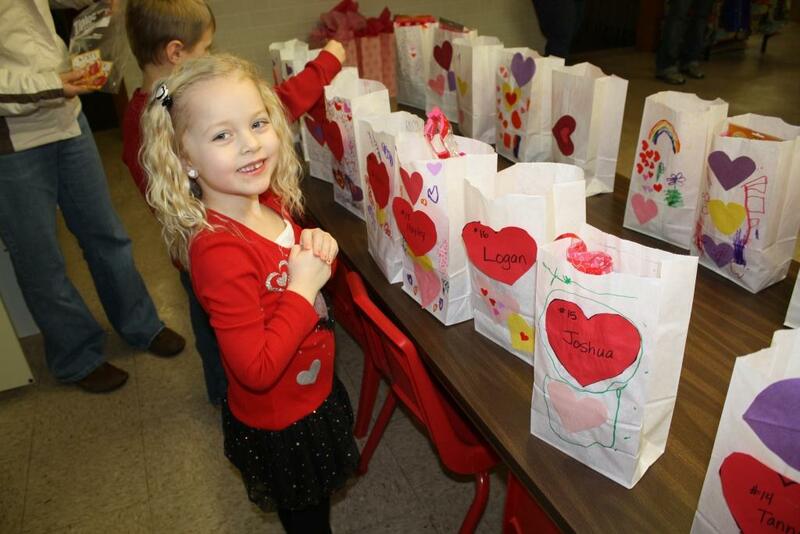 (Between Preschool, Dance, Gymnastics and AWANAS we had a ton of these babies to hand out!) I ordered them a few weeks early to be safe. When they arrived Kenley and I were so excited to get to work (she mainly just watched and commented on how much she loved them) I went to Wal-Mart to get the tiny dum dum suckers. 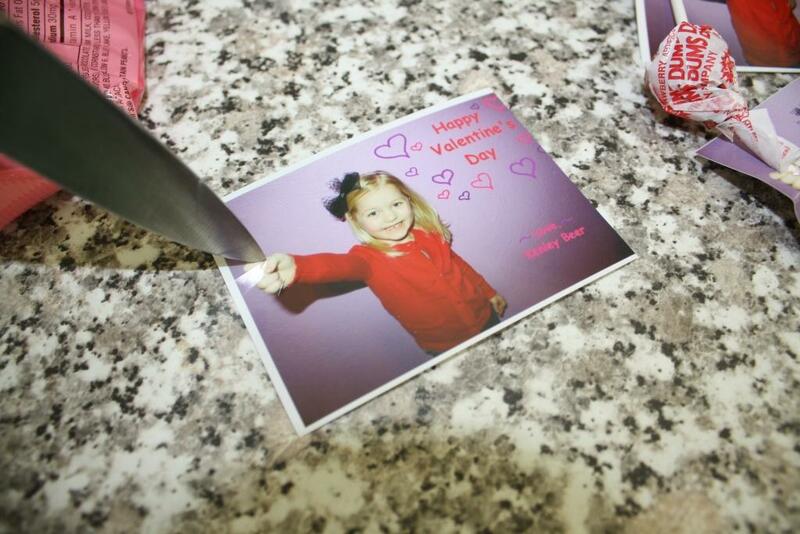 Then I used a sharp kitchen knife to cut an “X” at he top of her fist and an “X” at the bottom. …slipped the sucker through the picture. CA-UTE! Seriously, who thought of this idea? 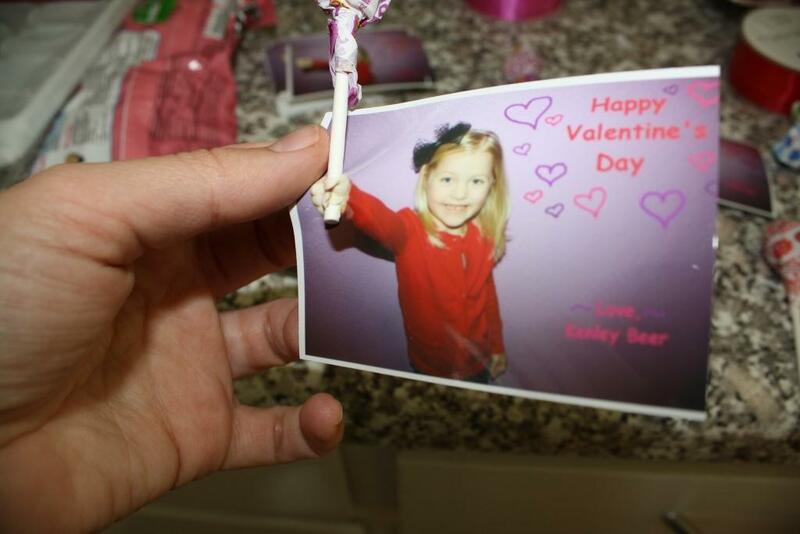 I really want to know where it originated from because these are probably the cheapest Valentine’s we will ever make. But I couldn’t stop there with just one sucker….more candy was needed for all her little friends 🙂 I put the sucker cards in plastic Valentine’s bags and dropped some red, pink, and white M&Ms and candy corn and tied it with some ribbon. For the teachers I gave them each a little sucker card and a heart cookie from the bakery. I also threw in some of the “Teacher Gifts” my mom has at her Christian Bookstore. 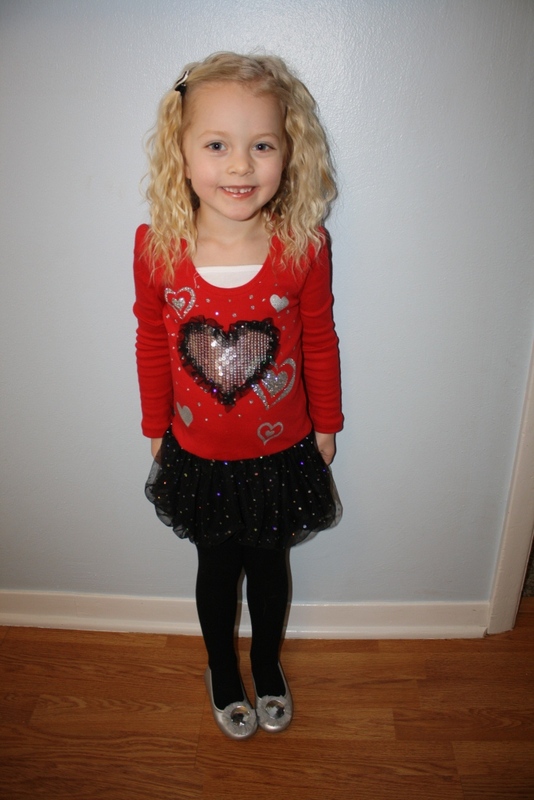 Kenley was very excited to wear her Valentine’s dress and pass them out at preschool. 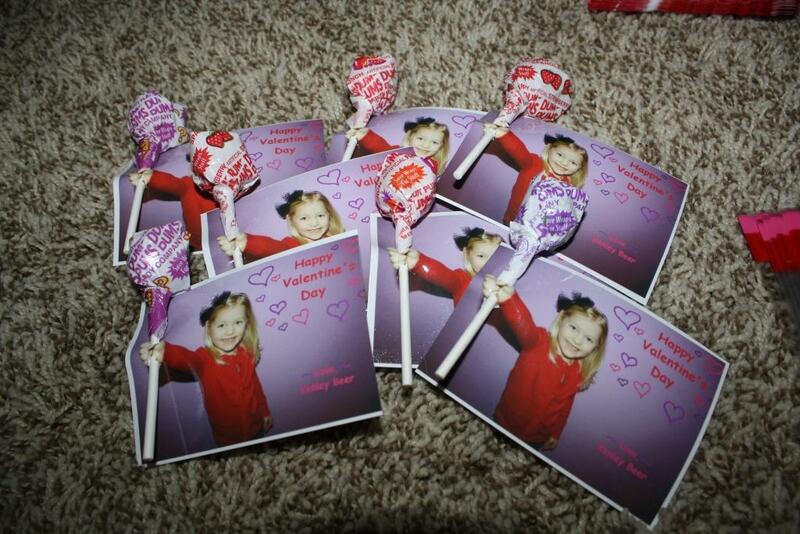 For Kenley’s 5 sets of grandparents and great grandparents I did the same Sucker Card but used the 4×6 prints and larger Blow Pop Suckers. 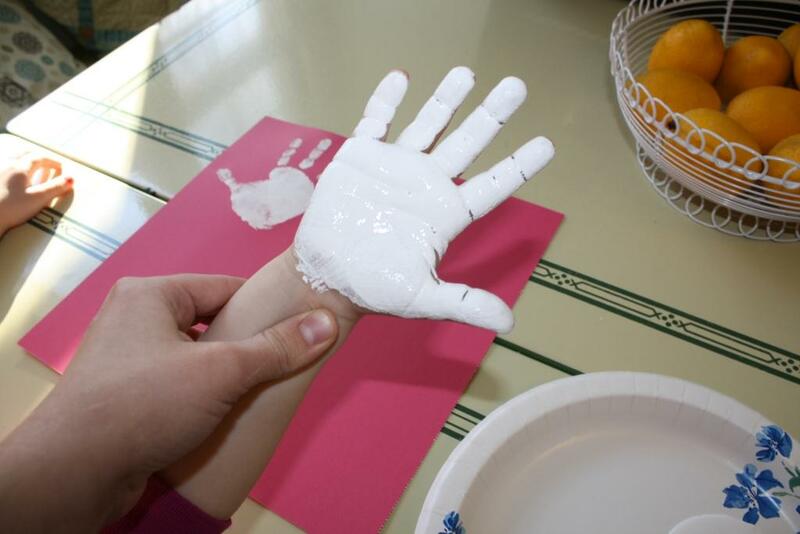 We painted her hands in white acrylic paint. 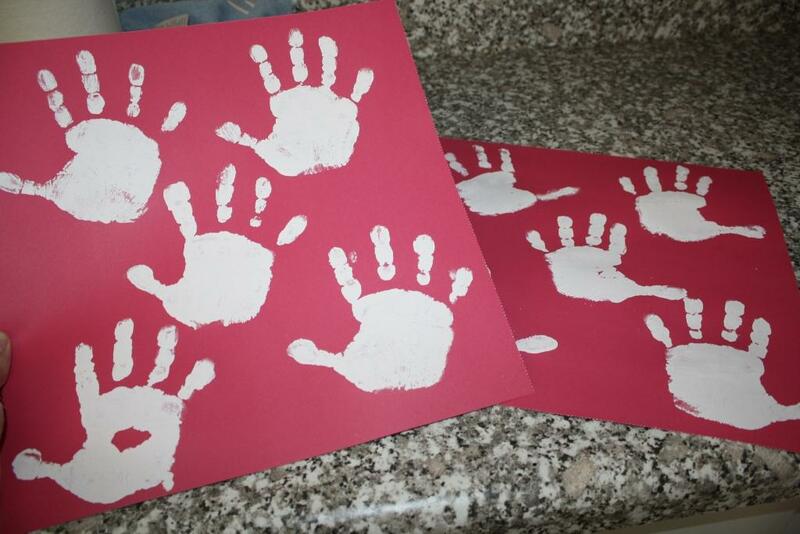 Then “stamped” each hand five times (one for each set of grandparents) on a pink sheet of cardstock. 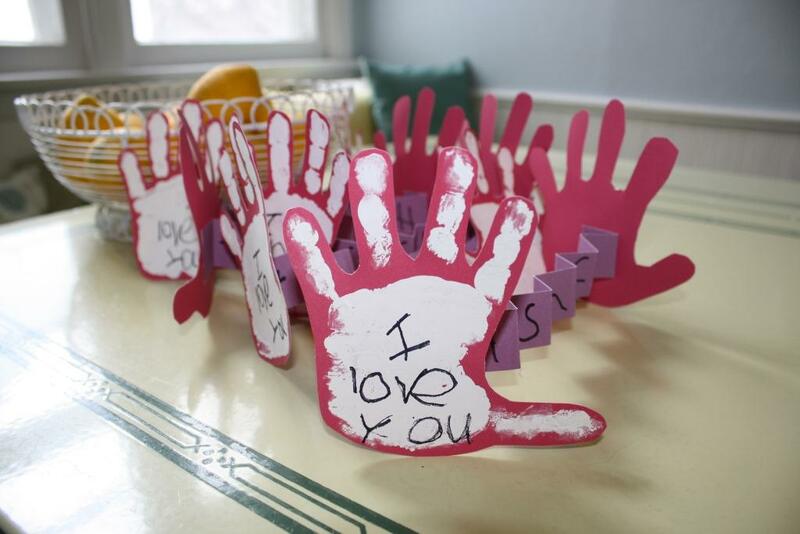 After they dried I cut around each handprint. 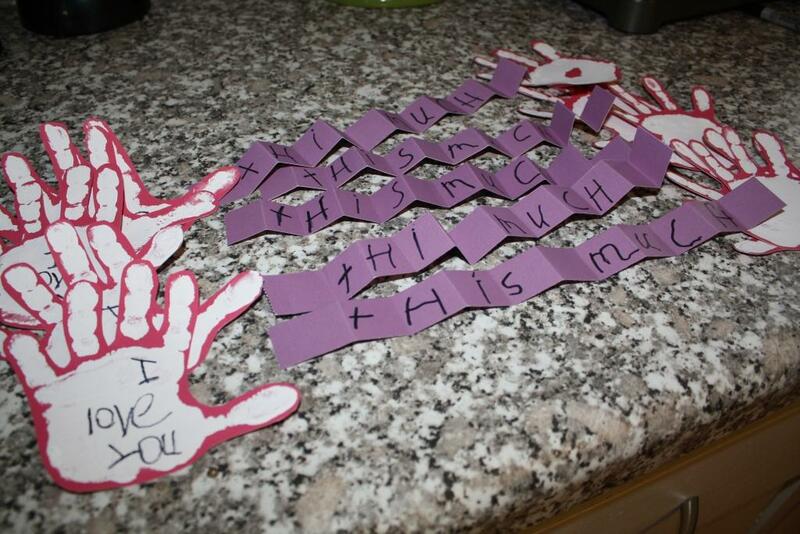 Then I had Kenley use a marker to write “I LOVE YOU” on all the left hands. I cut some purple cardstock into strips and accordion folded it. 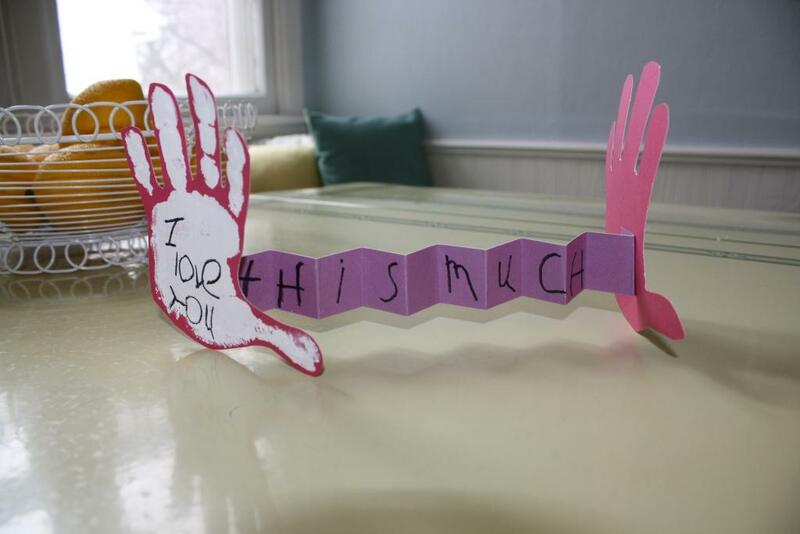 Then I had Kenley write “THIS MUCH”. 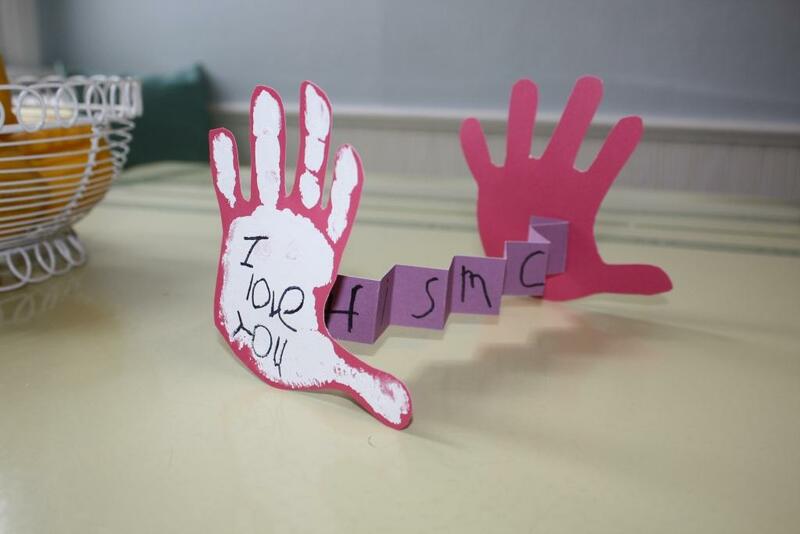 I used super glue to make sure the hands would stay connected to the accordion strip (some of these cards had to travel long distances to Florida and Arizona for the great grandparents that are “snow birds”). 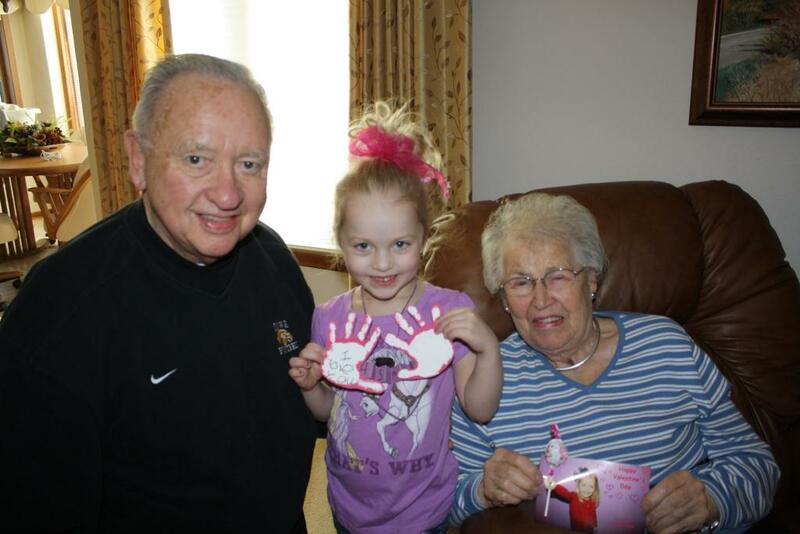 So each grandparent got a Sucker Card, and I Love You This Much Card, and I also threw in some pictures of my sweet kiddos. 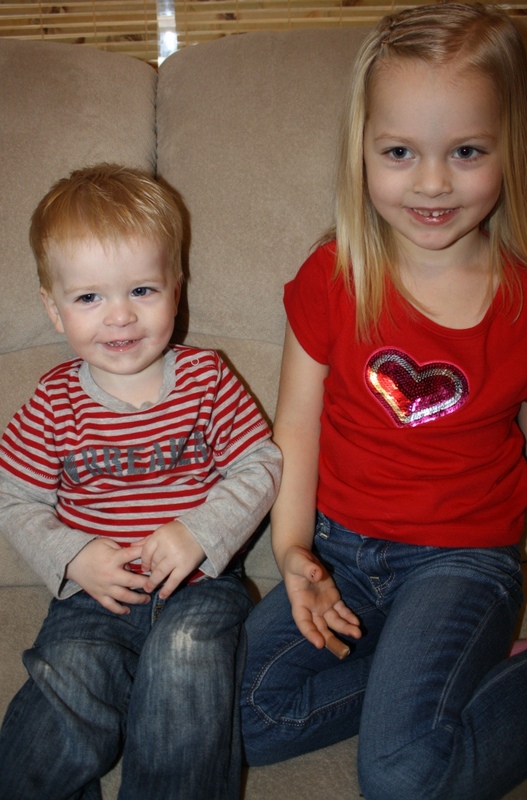 Every year I like to take pictures of the kids in their Valentine’s shirts. Here is last years. 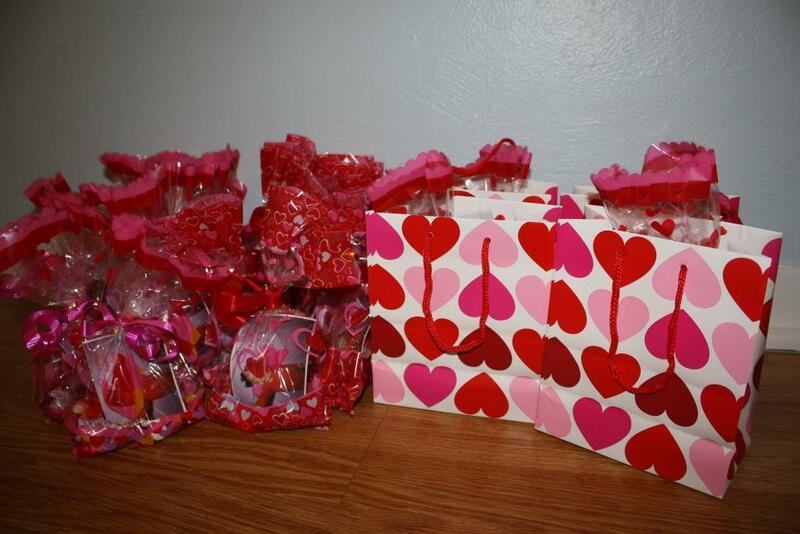 Keeping with the tradition of making all the Valentines gifts this year I needed something to make for my hubby. I used a 5×7 frame from Wal-Mart. Hot glued on a peacock feather I found in the craft aisle and some other decals I had sitting around. 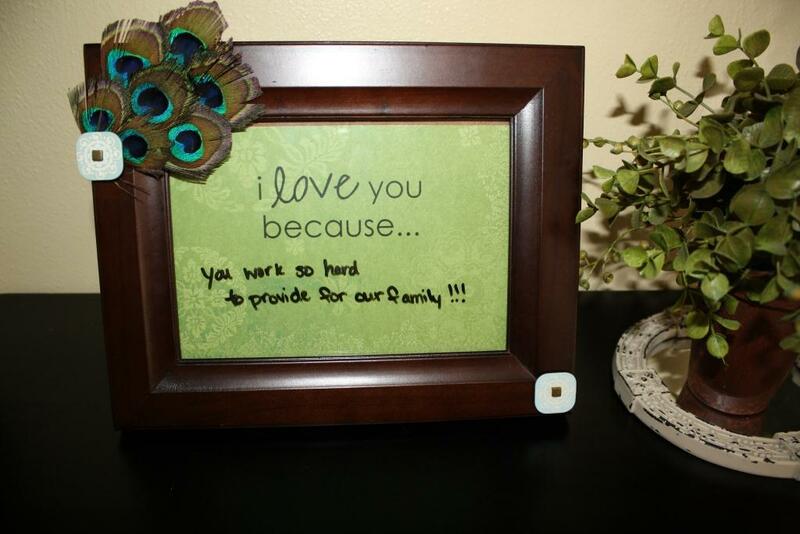 Then I printed out the words “I love you because…” on a piece of scrapbook paper. This gift cost me a whopping $7! 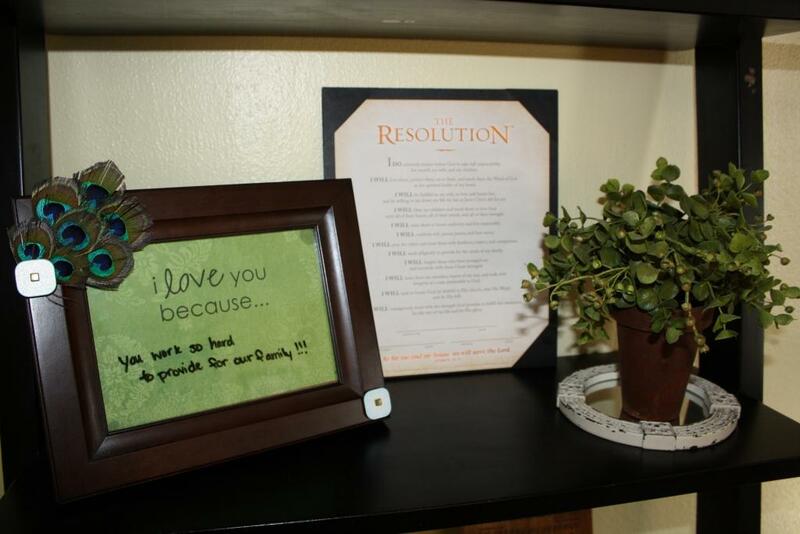 I also got Marcus “The Resolution” from the movie Courageous. We just love that movie (watched it again the other night). 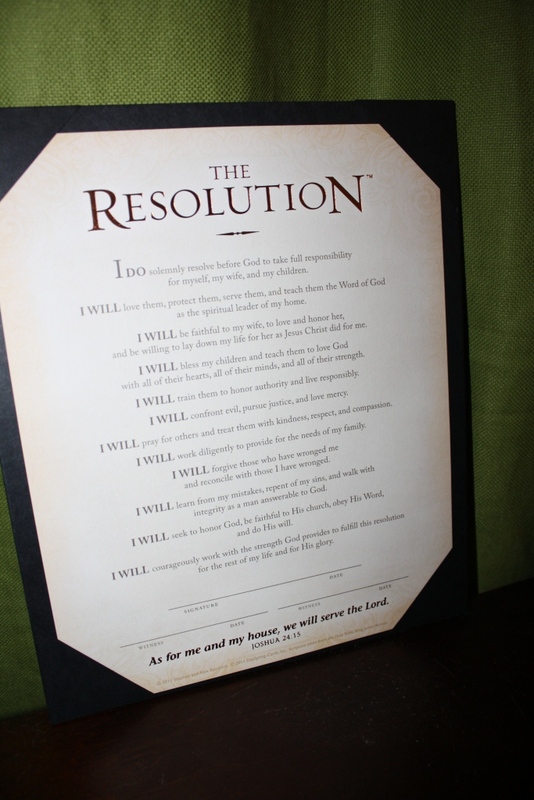 Like I have said before, my mom owns the Christian Bookstore in town and I was working the other day and saw that we had gotten in “The Resolution” from the movie. It was only $9! I still have to go out and get a nice frame for it but my husband had been talking about doing this so I knew he would really appreciate this gift. If you haven’t seen Courageous you should! It has a very important message that I feel EVERY SINGLE MAN should hear. 🙂 Great, great movie. We had a couple Snow Days (7 inches) a few weeks back. 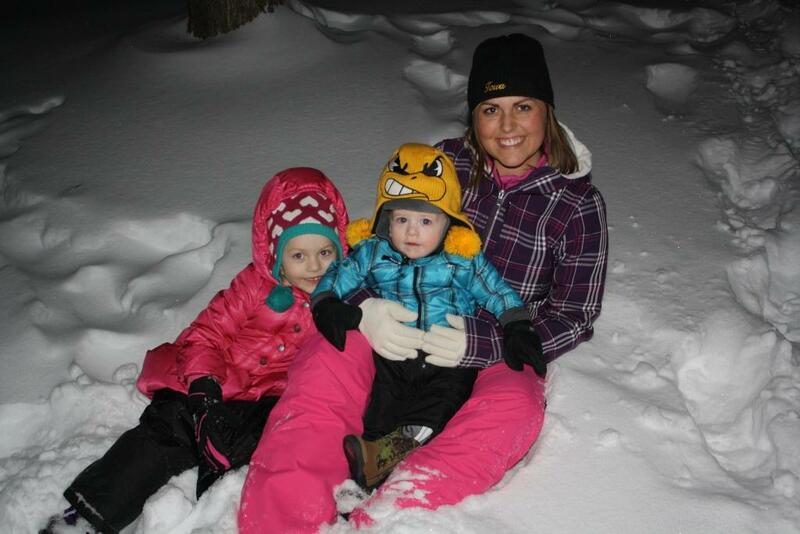 The only measurable snow covering we have had this year in North Central Iowa. I am sad to report (well not *that* sad) it melted right away and we haven’t seen any more of the white stuff since. 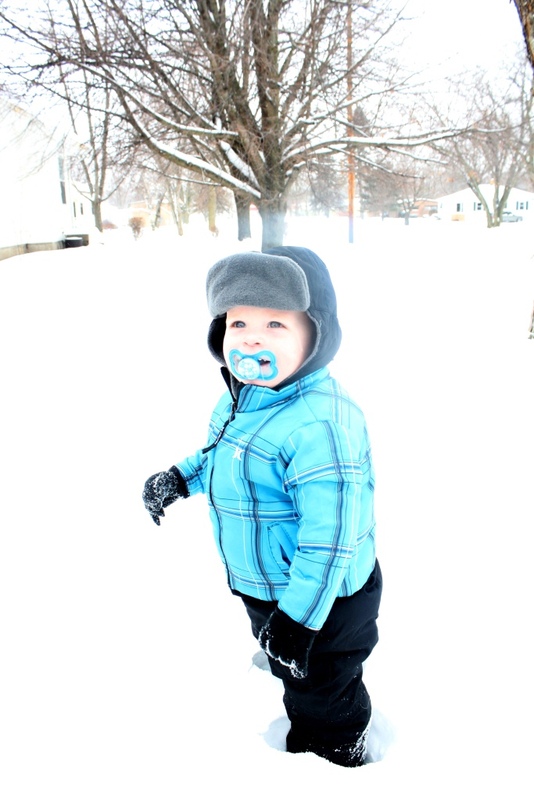 What a marvelous winter 2012 is turning out to be! 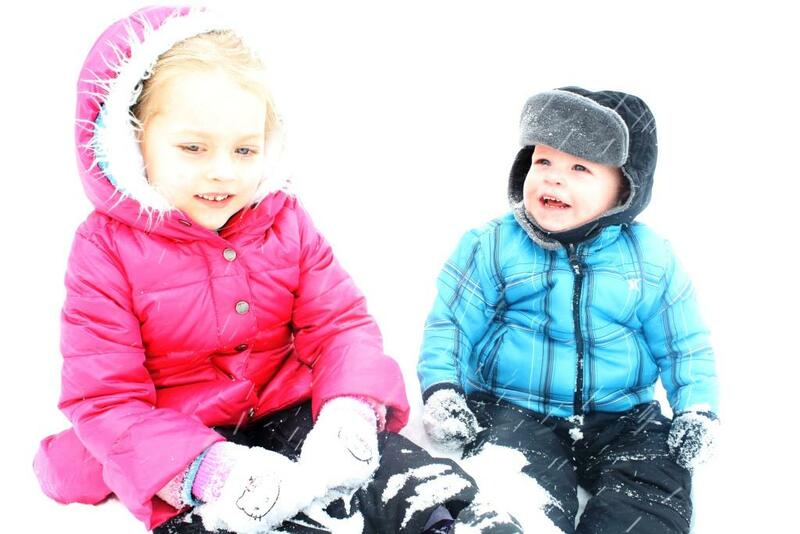 Here are some pics of my precious children playing in the snow. 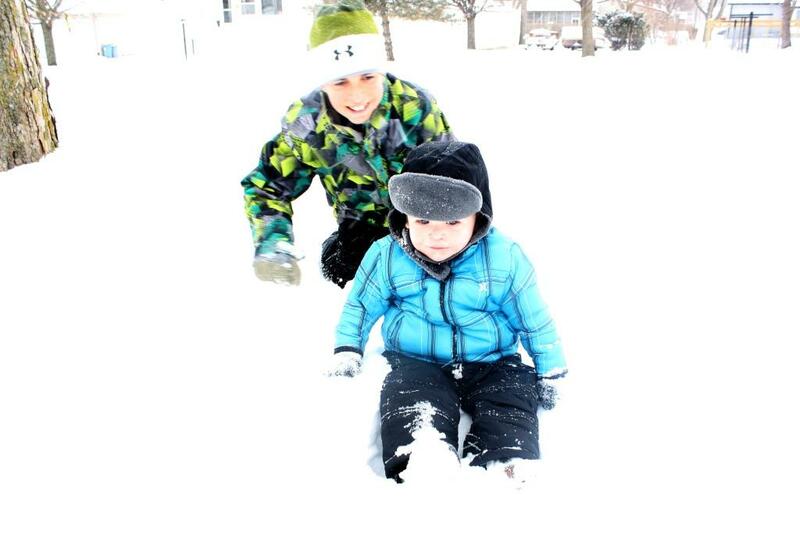 They played all morning with uncle Landon and then I joined in again at night while daddy snow-blowed the driveway. 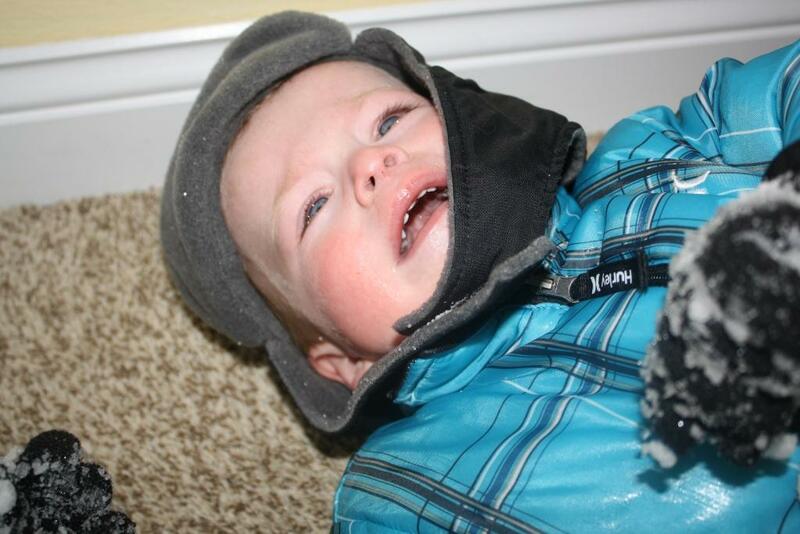 Cohen freaked out when we had to go inside. 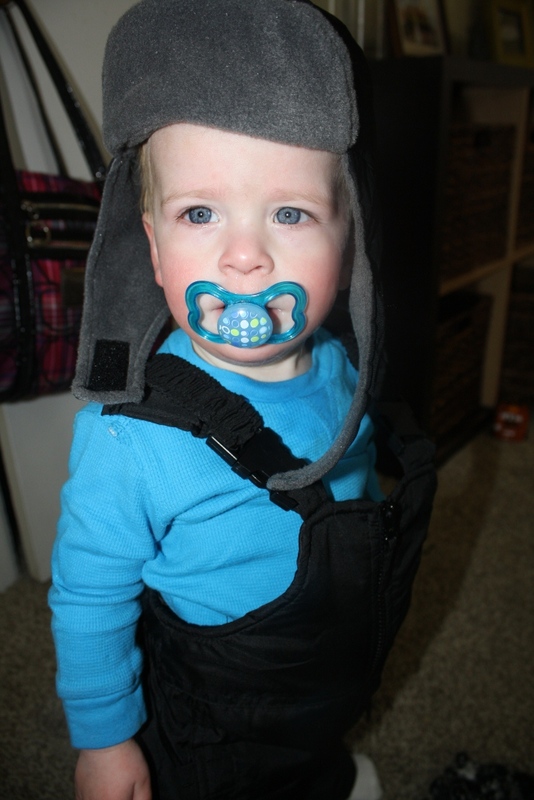 Is it bad that I laugh and take pictures of my son as he is having a temper tantrum? I can’t imagine I am the first mom to do this 🙂 Nothing a binky can’t fix. 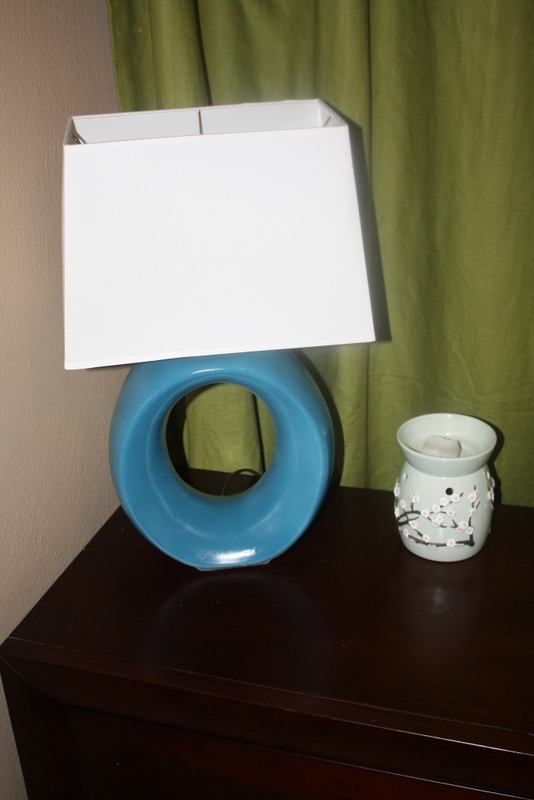 But I created one the other day with just my kids in mind (and I ended up loving it too). 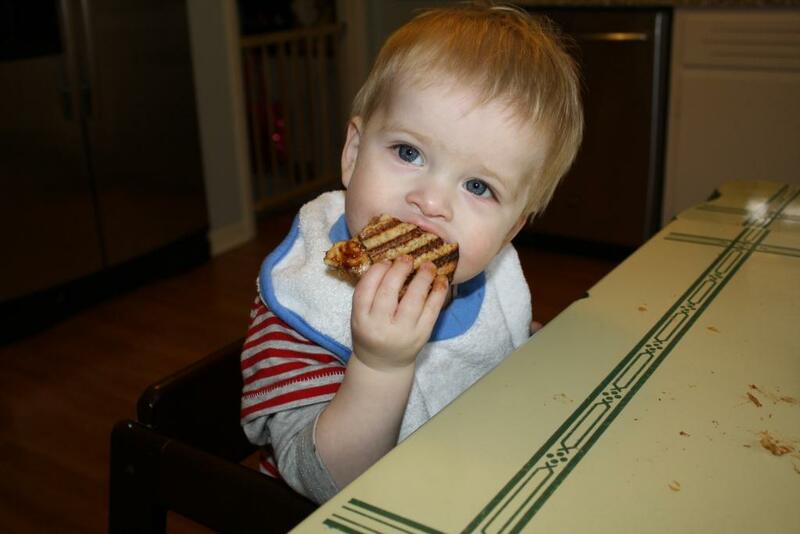 When I was a wee one my mother never made us Peanut Butter & Banana sandwiches (deprived? possibly). 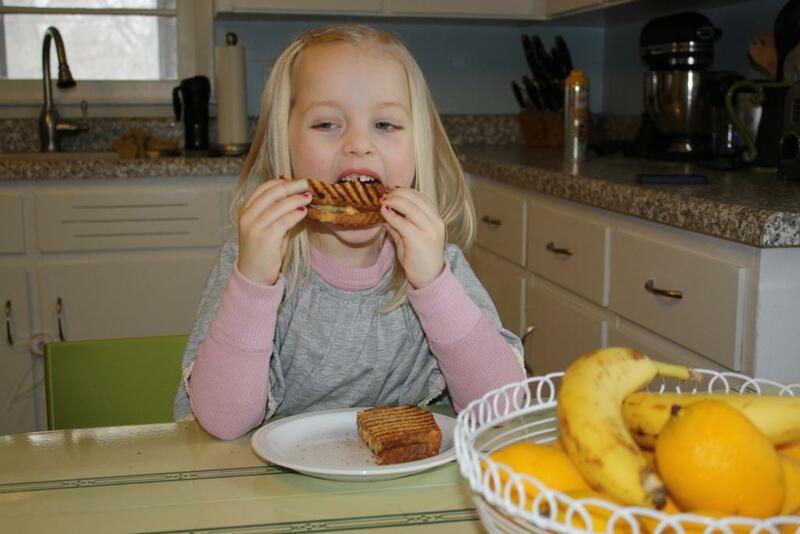 I thought it was really strange any time I heard friends talk about a sandwich with bananas in it?! I can honestly say I have never had one…ever! Well that all changed the other day. 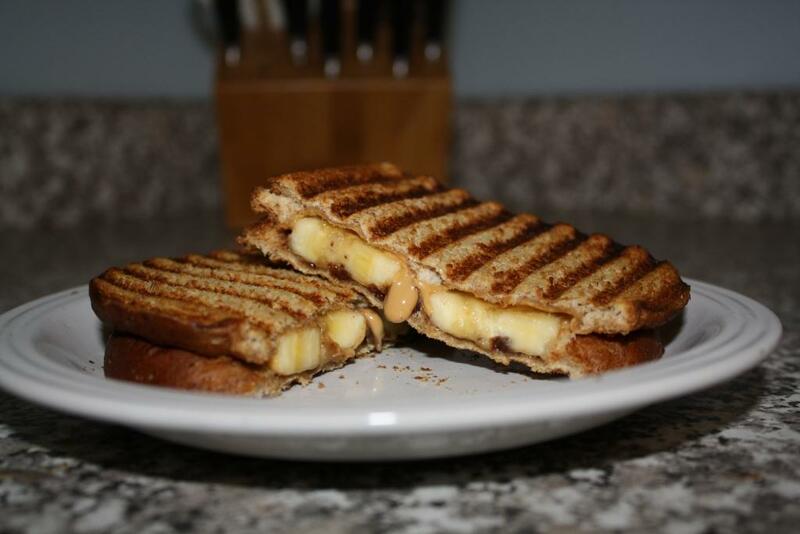 I have some bread that needed to be used and I was trying to come up with an idea for a panini for the kiddos. 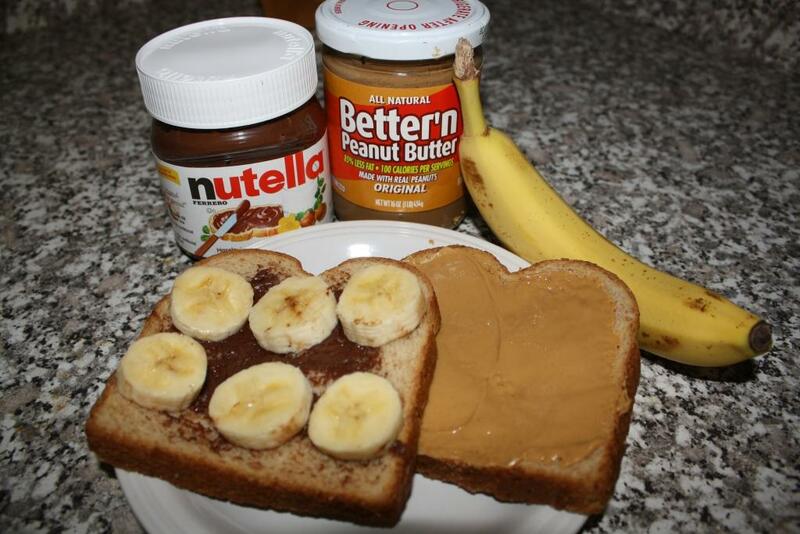 Then it hit me, I keep seeing Pinterest pins about PB & Banana this….PB & Banana that. So here we have the bread, some all natural peanut butter, and as luck would have it I had a few bananas sitting around. 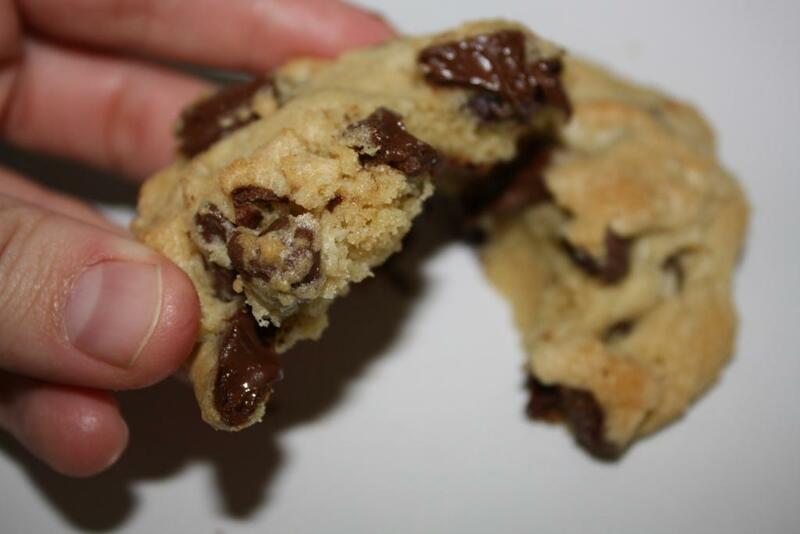 I slathered on a tiny bit of nutella too (yum!). I spread some butter on the outside of each piece of bread. Well now I know her reasoning, but I can tell you my kids and I will be eating these for years to come! Hard to believe I have written 100 blog posts in the last 10 months! So since my 100th post is a somewhat significant milestone I wanted to make sure I had a pretty sweet prize for this contest winner. But this will take a little bit more of an effort from my blog readers…..
2) Share My Page: You need to share my blog’s Facebook Fan Page on your own Facebook Wall. 3) Increase Your Odds: For every friend of yours that “Likes” my page you will be entered again (and again and again!) into the contest. So you can share my fan page on your wall as many times as you want! Make sure your friends let you know that they “liked” the page. 5) Leave A Comment: Make sure you let me know that you shared it on your page by leaving a comment on this post or somewhere on my Facebook Fan Page. Also, towards the end of the contest let me know how many of your friends “liked” my page so I know how many times to enter you. 6) Contest Ends: I will give reminders about the contest every day for the next week. The contest ends on February 17! 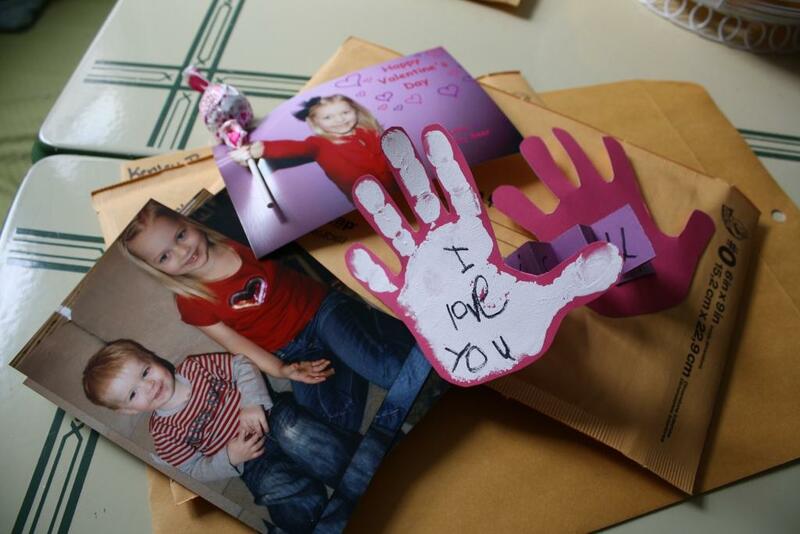 7) Winner: There will be one winner and the prize will be shipped to anywhere in the continental United States. My husband will be drawing the name out of a hat to decide the winner (I know, way professional 🙂 ) The winner will be announced the next day. I wouldn’t technically call our bedroom a “Master Bedroom” but since my husband and I sleep there then I guess it qualifies. 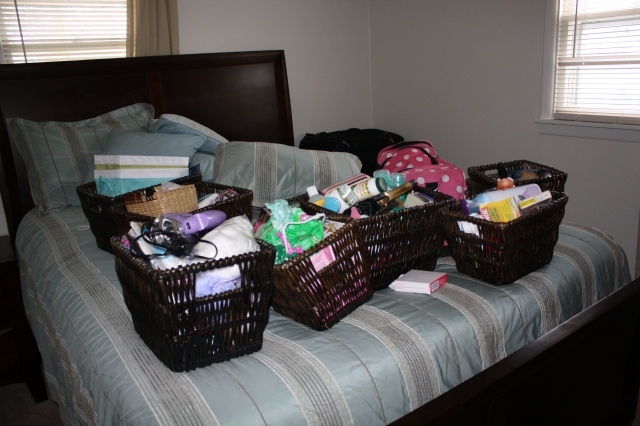 So the hubs and I were fine having the smaller room. 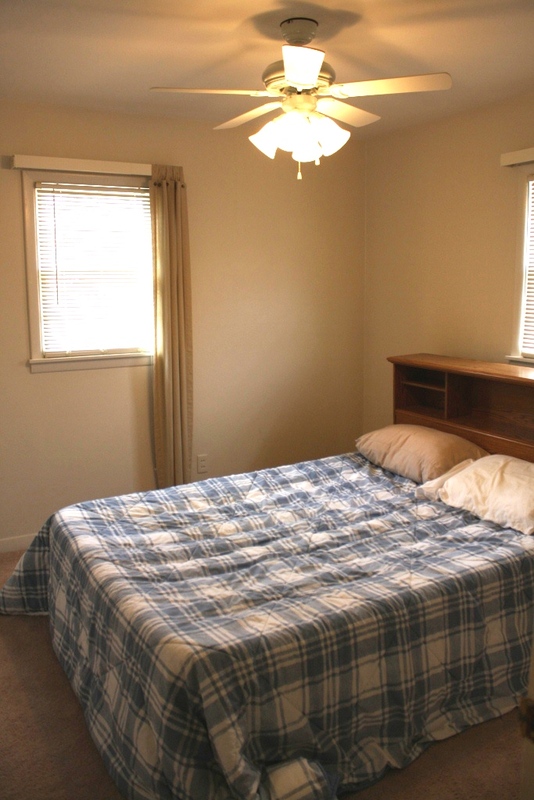 We just dream of the day when we can have a larger (more deserving of the term “Master”) Master Bedroom. You know, a king bed, a sitting area, his and her large walk in closets, flat screen TV, whirlpool, two separate vanity areas,…yes! *that* kind of Master Bedroom. 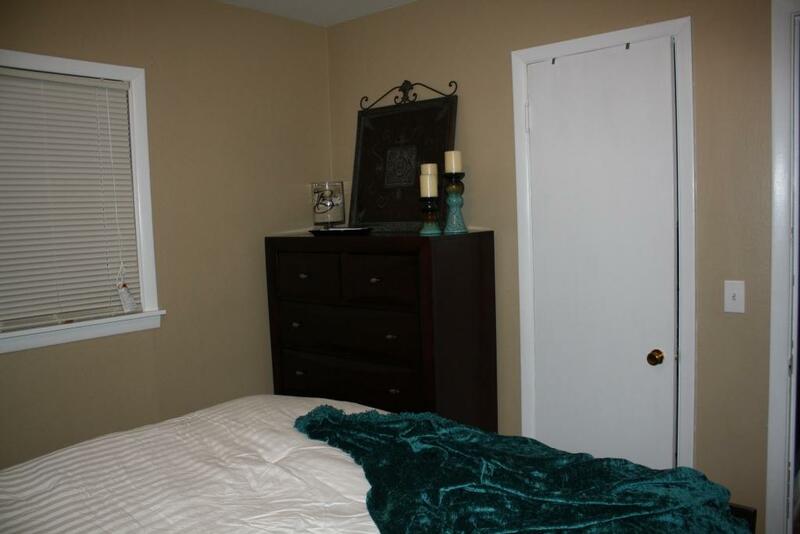 But let me show you how I took this tiny 11×11 room and made it our own …. 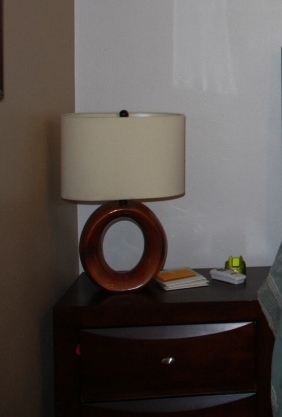 Here is what the tiny thing looked like when we purchased the home. Here is what it looked like after we moved in our massive furniture. 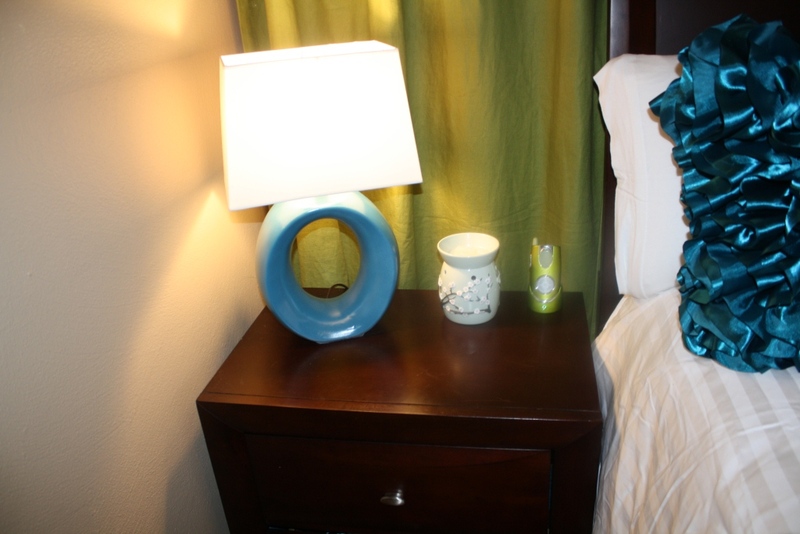 There is about an inch on each side of our night stands. The dog can barely jump up on our bed at night because he can’t even get a running start 🙂 Poor Colt. Then top it all off we had to fit our dresser in there. So when you walk around to Marc’s side of the bed you have to squeeze by that. 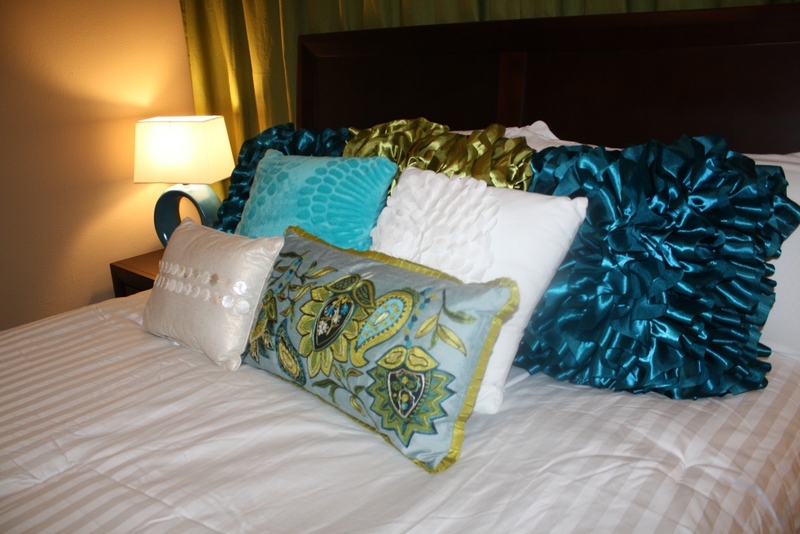 But like I said, it is COZY and we wouldn’t have it any other way! 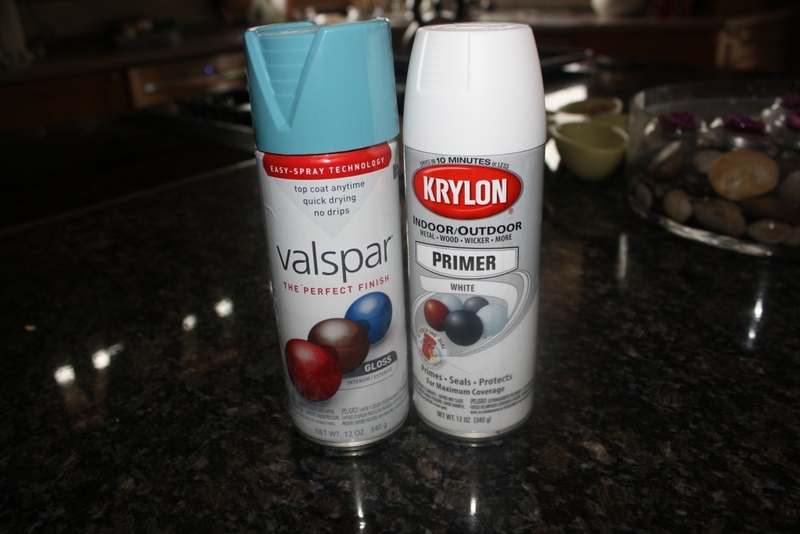 We started by painting the trim Valspar off the shelf white in a semi-gloss base. 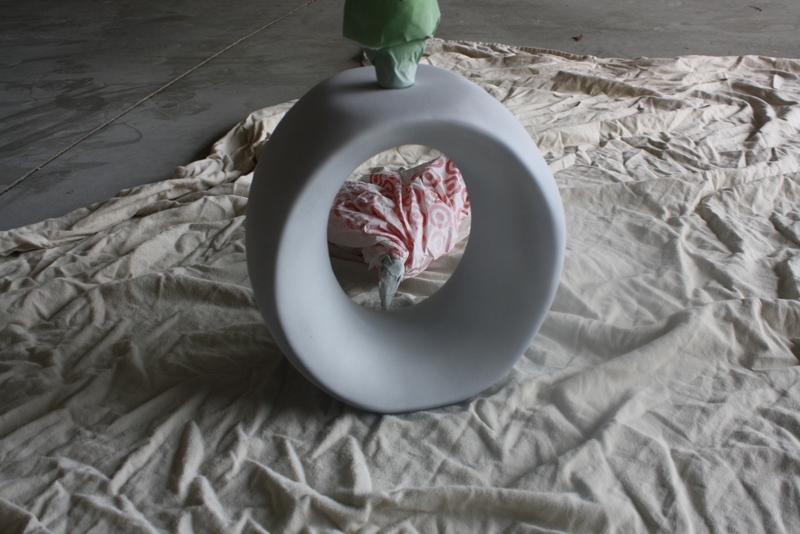 Then the walls were painted in a Valspar’s Incandescent in a satin base. (Kind of a khaki color). 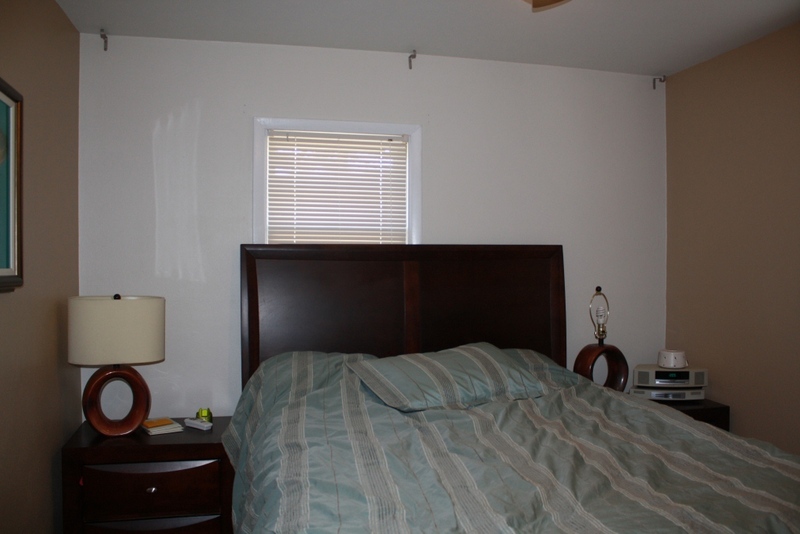 We didn’t paint the back wall because I had a different plan for that. 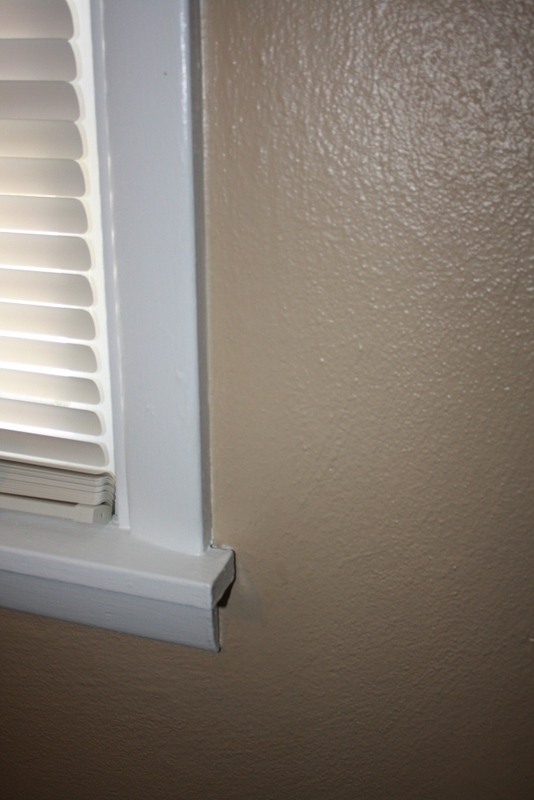 Here is a before and after of the paint/trim. 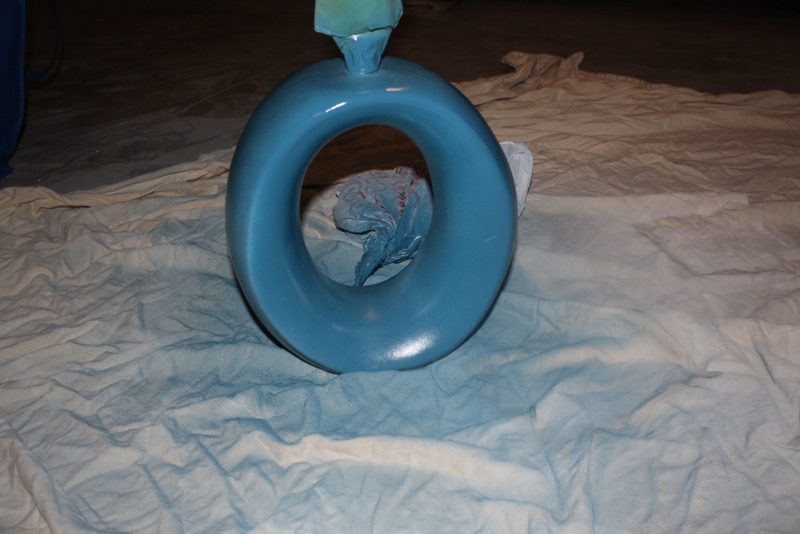 The hardest thing to work with was the off-centered windows. 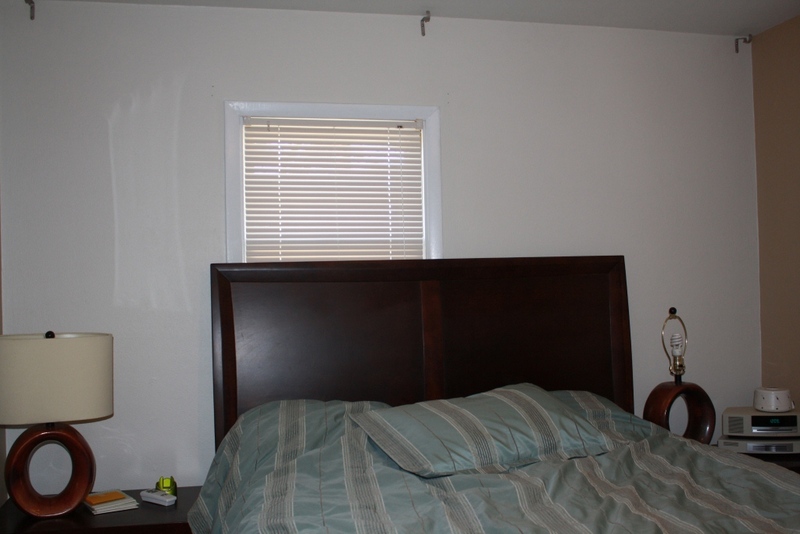 No matter what wall we put our bed on, our headboard went half way up one of the windows…looks really odd doesn’t it? But don’t worry, I had a plan! 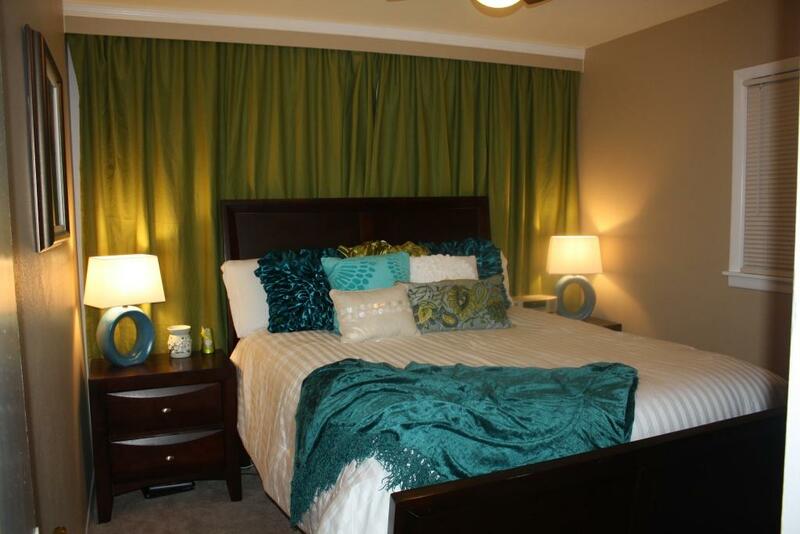 I had four apple green Pottery Barn curtains that had hung over the large picture window in our Ankeny House. 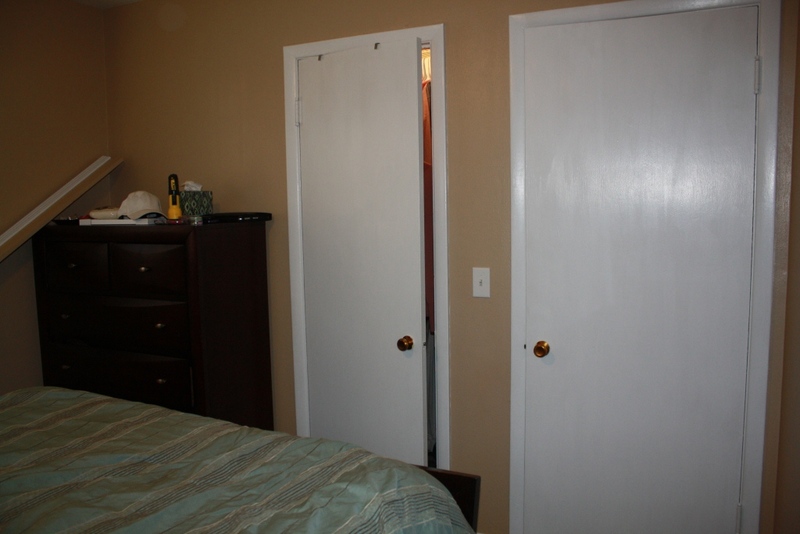 I figured that they would fit the entire back wall of our bedroom (floor to ceiling)….AND I WAS RIGHT!! (This was my way of just getting “rid of” that off-centered window by covering it up but still making everything symmetrical. I got the cheapest rod I could find from Wal-Mart that would extend to around 180+inches. 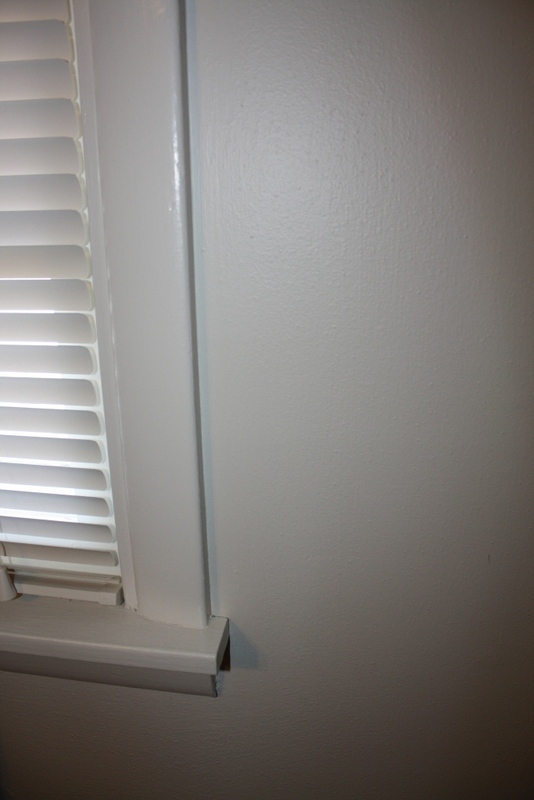 Then I had the painter, Matt, build a valance out of wood and trim so that the rod wouldn’t be visible. Turned out great. You really have to see it in person, to notice that it makes the room look SOOOO much bigger! 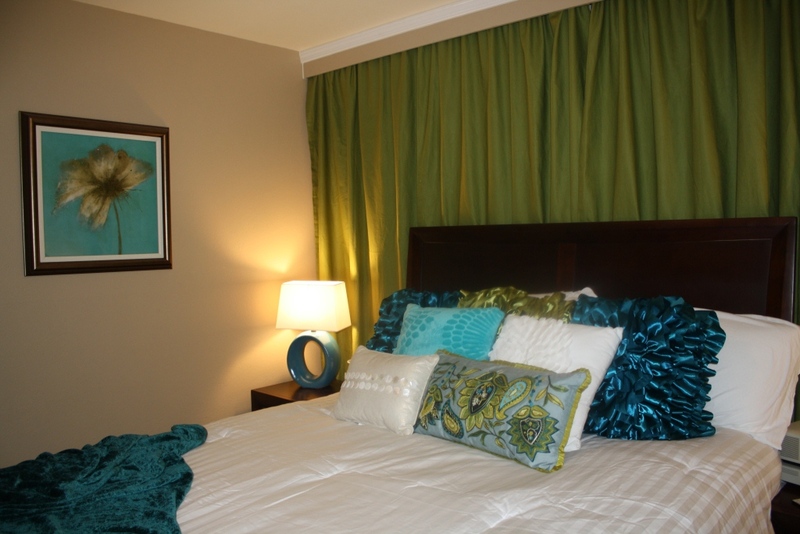 The blue bedding we had just didn’t look right with the green curtains so I sold it. Then I went out and just got a cheap white comforter from Wal-Mart ($24.99 people!). 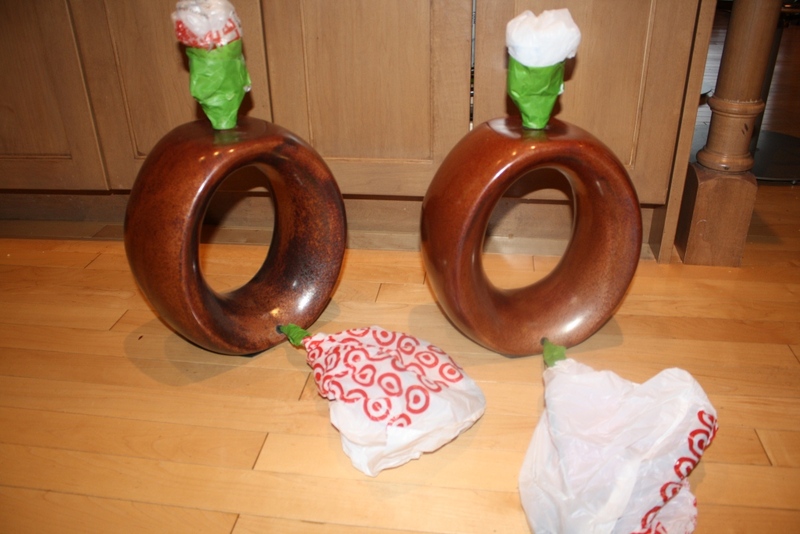 Lastly, I spray painted the lamps (read about that here). 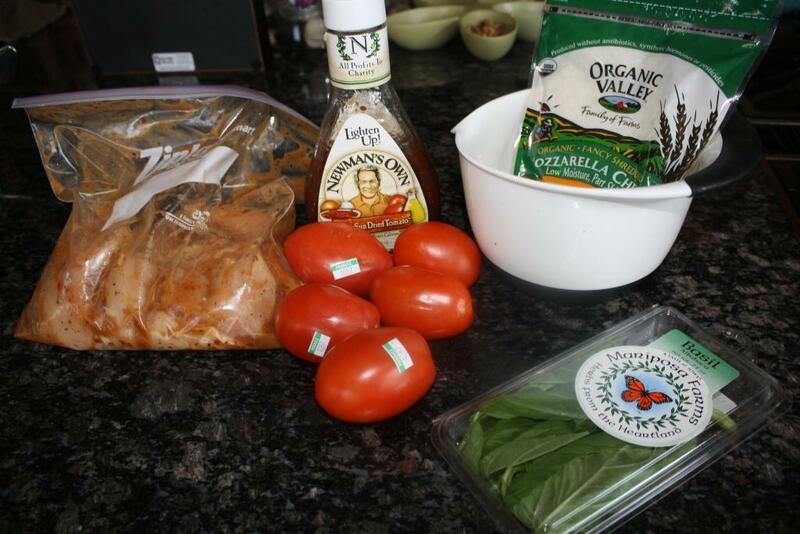 Here is a simple, easy, yummy recipe from Pinterest for Grilled Bruschetta Chicken. The original recipe had the chicken being grilled but I used the oven instead. Place chicken in zip loc bag. Add 1/2 cup dressing and seal bag. 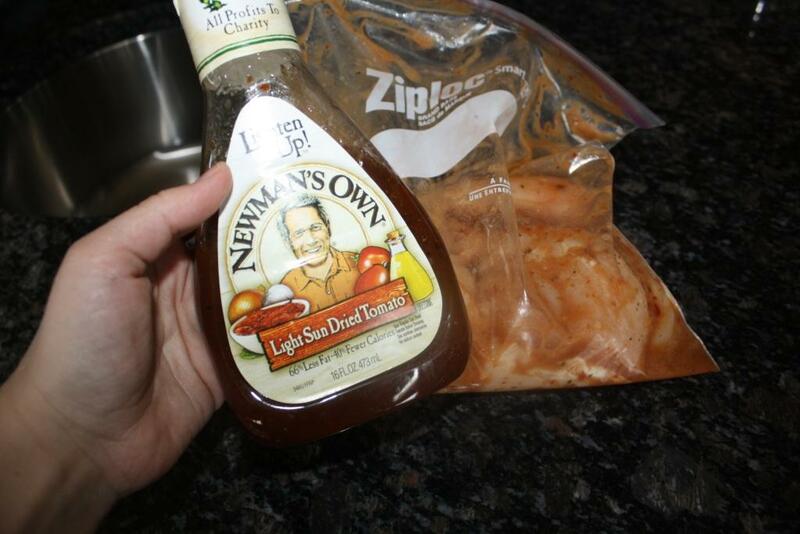 Turn bag over several times to evenly coat chicken with dressing. Refrigerate for 10 minutes. I actually let it marinate all day. 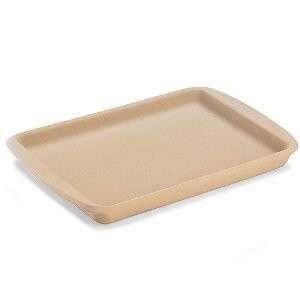 Remove chicken from bag and place in a greased 9×13 casserole dish. 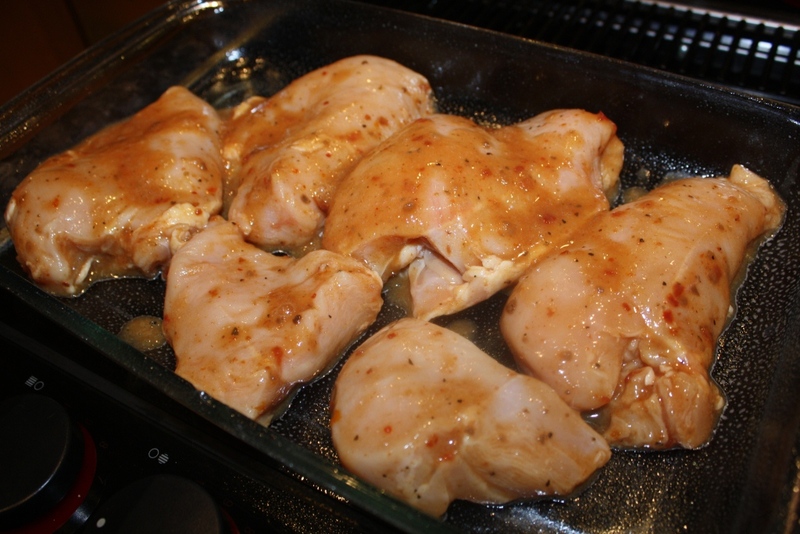 Bake chicken in the oven for 30 minutes. Meanwhile, combine the chopped tomatoes and fresh basil. 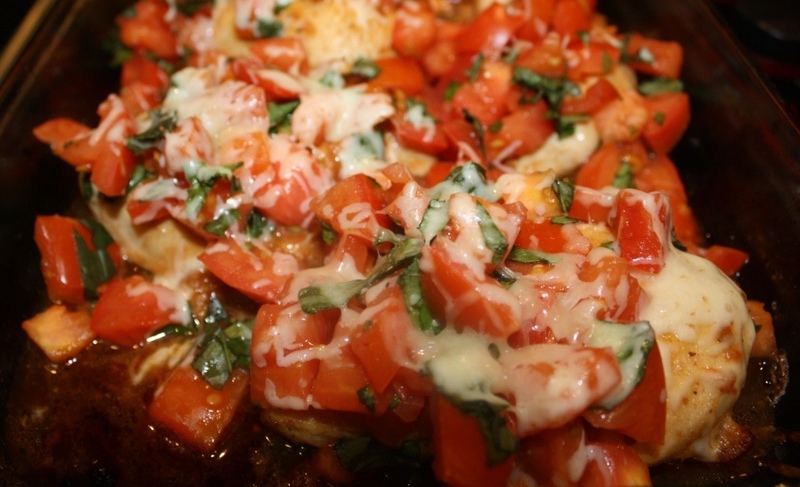 Take chicken out of the oven and top with tomato mixture and then sprinkle with cheese.